Great tragedies are supposed to have names. The Titanic, the Lusitania… Their dead live forever in the stories we tell about them and the living fight for change in their memory that they might not die in vain. This is just a boat of ‘migrants’ that sunk in the Aegean, another number, another regrettable spat of collateral damage in the border war. But not to us, the ones who were there when the rescued came into harbour. Not to me. Last night was the most traumatic of my life. Back home, I spoke with confidence about how ‘borders kill’ – but now I’ve seen it with my own eyes and I will never forget the sinking of that nameless ship. Official Count So Far: 35 confirmed dead (5+ children) – not that the officials are bothering much to keep counting… Many still lost at sea & families waiting for news including Named Shorooq, still in Greece searching for her children. My friend Ashley and I were supposed to drive back across the island of Lesvos to Mytilini yesterday, but every couple of kilometers along the beach we saw another dinghy coming in without enough volunteers to meet them, so we stopped, and stopped, and stopped again. The sky was blue but the sea was furious, the wind was biting. Freezing children bundled into cars, battles for access to the bus, ambulances called for the sick… it’s chaotic and distressing, but it’s the daily reality on the beaches here and it’s remarkable how quickly you adapt, find a way to be useful and to cope. We were not prepared to cope with what was coming. We hadn’t eaten all day so we decided to stop at the port in Molyvos to grab some food. We were a few bites into our bread when the sirens started: the coastguard was coming in from a rescue. We ran to the water, where volunteers, locals and medical teams were converging, armed with emergency blankets. Rumours flew that this was a bad one. We expected people who’d been in the water, but had no idea the boat that went down could have had 300 souls on board. Later that night, I would meet Gabriel, a photographer I knew from Skala who’d seen it happen from the cliffs. He was the one to call the coastguard. He showed me two photographs, taken he said just a minute apart. 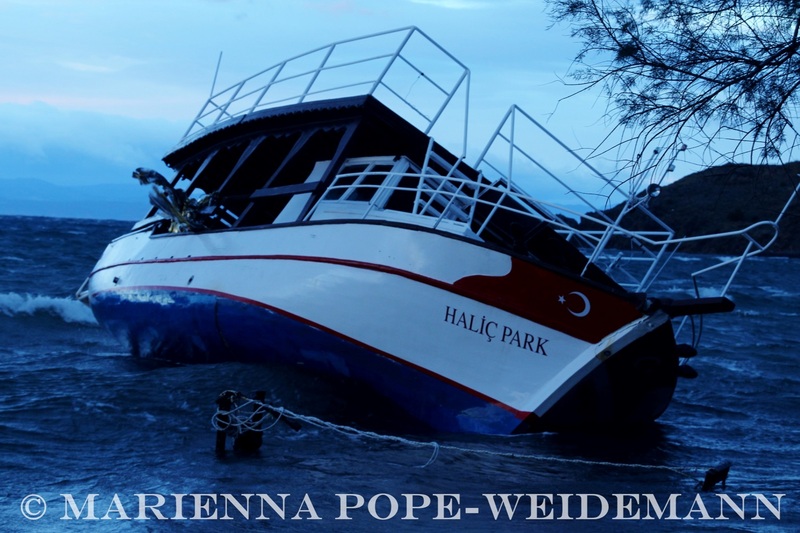 The first was a blurry image of a two-storey wooden boat – the kind that started appearing on the beaches during last week’s storm, left at terrifying angles on the beach with broken windows and emergency blankets fluttering from the railings. In the second photograph, the boat was gone completely; all that remained was a pool of orange life preservers, shining in a great expanse of blue. Ten or fifteen children came off that first rescue boat, which headed immediately back out to sea. 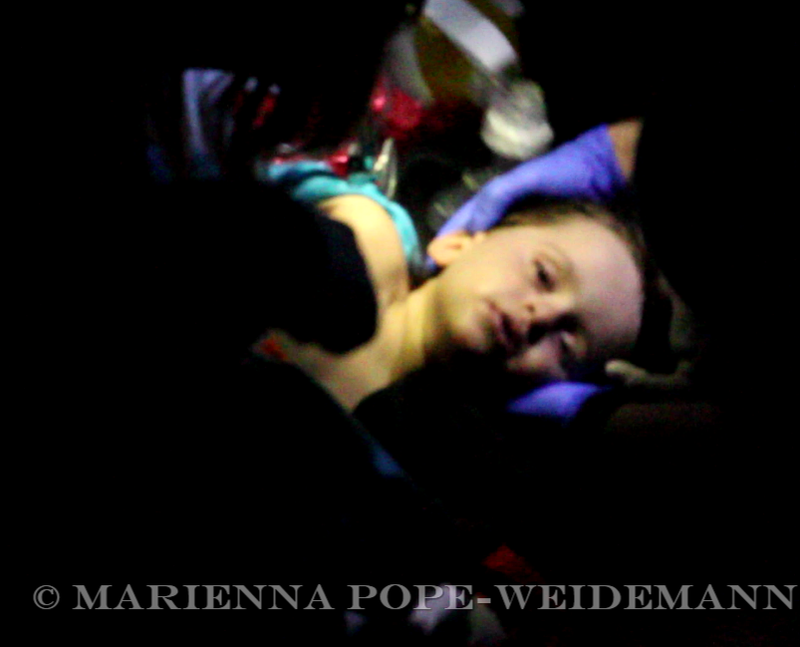 I threw my camera around my back and put my arms out to receive a young Syrian boy from the coastguard. He couldn’t have been more than nine years old. I ran for the medical team, transfixed by his face, that looked so peaceful but for the dullness of his skin and the blue in his lips. I lay him down by a doctor, who was already working on a little girl, so I got my first crash course in CPR. It was terrifying. I was so afraid of hurting him, of doing something wrong. 30 chest compressions. Hold the nose. Two breaths until the chest rises. (Please, look this up on YouTube if you’re coming out as a volunteer.) His mouth was freezing. Sometime into the second round another medic arrived and we worked as a team. The boy started coughing up water, and once he was breathing right we stripped him of his wet clothes. Then the medic was gone again. I’ve been an atheist all my life. But that was when I started praying. I wrapped him up and lifted him onto my lap, tearing off my jacket and covering his body with mine. I don’t know how long we sat there. I glanced over and saw Ashley holding a little girl by her ankles while the medics tried to get the water from her chest. Every time I saw a medic I had them check him. They were overwhelmed with critical cases and they said he was okay. But he didn’t look okay to me. I was rocking him back and forth, talking constantly in English and my pathetic amount of Arabic, trying to keep him awake. I’ve never felt love as desperate and immense as holding that boy in my arms. I don’t even know his name, but I will never forget his face. A good friend warned me recently that you cannot be a volunteer and a journalist. Journalists do not get involved. I thought about that a lot as I held this boy, who in that moment had only me in the world, and watched photographers circling like vultures, getting in people’s way, shoving their lenses where any decent human being must surely know they don’t belong. And all I could think was: If it’s true you have to choose, I don’t want to be a journalist anymore. Finally the ambulances came, and in a few minutes he was bundled in the back and whisked off with the others. From what I hear, it sounds like he didn’t make it. They’re saying most of the children died. They had been in the water too long. We thought it would be over then, but I was woken from my daze by the second siren; the coastguard was back with another boat full of people. I took an Afghan woman from the boat. She gripped my neck like she was still drowning, but had no concern for herself. “My mother, my brother!” She screamed. I tried not to think of my own mother drowning. “Boats are still coming,” I told her in English. I knew she understood but she made no response. “We have to care for you now.” At first she wouldn’t let me. I sat her down and blanketed her before working on the clothes. “Please, please, my mother is a good woman.” I nodded. “So many people who come here are good,” I said. Her name was Sultana. She was alone now, she kept saying. We got her changed, shaking and crying, and in that moment feeding her water was the most beautiful thing I have done in my life. The local priest had opened the church for shelter so I took her inside. Recovery position. Coughing up the last of the water. I took her name and promised I’d look for her family, that she should stay where it was safe and I’d come back for her. She kissed me and kissed me. I did come back for her, but she was gone, and in the chaos I couldn’t find her again. There was one more boat after that and fewer people this time. By now, the coastguard had given up the search. 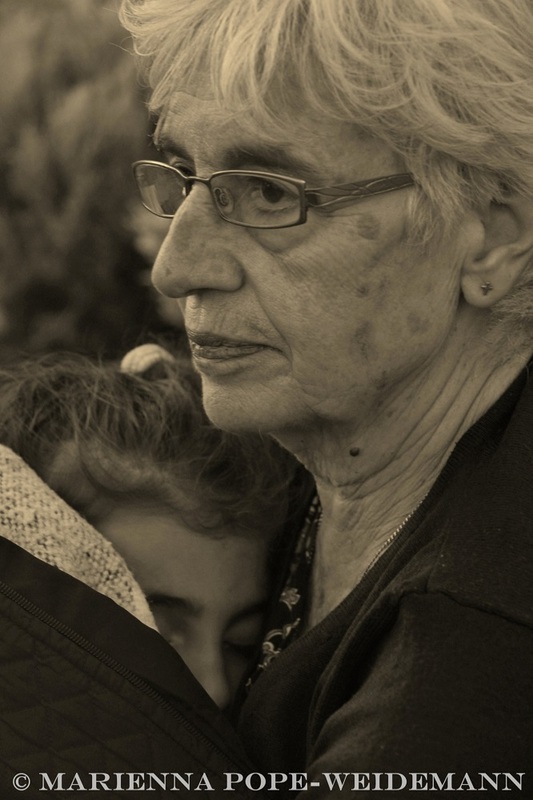 Locals had opened their tavernas and cafes for shelter, making caldrons of tea while elderly Greek women rocked motherless babies in their arms. There were so many families split. I ended up working with a translator to help the International Rescue Committee (IRC) compile a list of names. I was dealing mostly with the mothers. They were relieved to have someone asking after their children. Typically they stayed calm while they spelled each name and gave the age of each child. Then when it was done, and the helplessness set in, they broke down and wept and beat the floor. I held them as they cried, feeling useless. One of them, a beautiful Syrian woman called Named Shorooq who I’d helped change before, had lost her husband and all three children. But she was one of many. When the translator left I hid in an alleyway where no one could see me and sat down to cry. It didn’t last long – it couldn’t. I wiped my face, stood up and went back. The first person I ran into was a volunteer asking for help with another mother. She sat in a doorway with her wet clothes still on, refusing everything, even water and sugar tablets. She would take nothing until we found her two month old infant. I spent a long time trying to figure that one out. Once she recognised me as ‘the person on the phone’, her eyes started following me wherever I went. Every time I took a call, there was hope in her eyes. I started gesturing ‘no news’ as quickly as possible. Then the news came: there were two very small babies at the hospital, but it looked like they wouldn’t make it, and we couldn’t bring the mother to the hospital because the police weren’t letting anyone in. She had been rescued at sea, so she was ‘in detention’ until she registered and got her papers. No papers, no hospital, they said. In my shell-shocked state of mind, and with the mother’s eyes always on me, I became fixated on this singular injustice. While I assisted the other volunteers, I kept returning to it. I argued with the police. I argued with the sole UNHCR staff member. No one with the power to do anything seemed willing to try. I was haunted by the notion that the presence of its mother might make the difference between life or death for that baby. At the least, she was being robbed of her chance to say goodbye. My rage became unspeakable. Suddenly, like an alien from another planet, good news appeared for the other mother: ‘Shorooq family found.’ They’d been dropped somewhere else and were being driven back. I grabbed a translator and headed to where I’d left Named. It sounded like it was all of them, but we didn’t want to risk it so we told her all we knew was that some relatives were coming. She started crying again, kissing my hands, refusing to let me go. I decided to wait with her, as much for my sake as for hers. I needed to see something good happen. We held each other as we waited and I listened to her pray. Every time a van came she was moving with impossible speed, despite her exhaustion, her nose pressed against the windows looking for her babies. In the third van, her husband came, carrying her youngest, 2 year old Razan, in his arms. There were no others. She fell to the floor and screamed, thumping his legs as she wept, still gripping my hand. This wasn’t what we’d been waiting for. It was almost worse than nothing, as though in the presence of this little child all she could see was the absence of the other two, the death of her hope. I told her more people were coming, that names were still being found, children were still in the hospital. It was possible they were alive. But I didn’t really believe it, and neither did she. Her daughter, Maram, was six. Her other son, Malak, aged three. Eventually, she took Razan in her arms like she would never let go. I left them grieving together and went to give the other mother some answers. I couldn’t bear to see her waiting any longer. I explained there were babies at the hospital receiving intensive care. We could not bring them to her, or take her to the hospital to identify them. I was sorry. At the very least, I would find someone to help see her to Camp Kara Tepe in the morning, to be fast-tracked for her registration papers. Naturally, I went to the UNHCR guy. As calmly as I could, I told him I accepted there was nothing to be done for her tonight, and that she knew it too, but please could we just talk about what would happen tomorrow, so I could tell her something. Anything. He stared at me and made vowel sounds. “Please, can you take her name at least? We can have someone look for her tomorrow, make sure she gets where she needs to go?” He shook his head. “Registration is the police’s responsibility.” I asked him exactly what his responsibility was. He ignored me. Now I was really incredulous. I felt sure he could do something, or at least try. Anyone with phone numbers and the will could have done that. “You know the police will not listen to her, even if they understood Arabic,” I argued. “Please, can we talk together and try to figure out how to do our best for her?” He walked away from me, but with the help of the IRC, we formulated a plan to have them collected in the morning and another family member fast-tracked so she didn’t have to go to the hospital alone. I think I knew then she would be going to identify the body. I don’t have words for how that conversation felt. I spent the rest of my time in a waterfront café, getting a few people fed while Ashley used her smartphone to help people contact their families back home. Across the table from me, a volunteer from Drop in the Ocean, an incredible Norwegian organisation, was comforting a teenage girl named Sara whose entire family had been lost at sea. She wouldn’t take any food. An LCD TV screen shone down on us from the ceiling, showing adverts and a basketball game: a window to another universe that never seemed so unreal. Then the news came on, and we watched images of ourselves from the hours before. It was so surreal. Eventually we found somewhere to stay. We talked a little, just to hear each other’s voices I think, and I cried quietly until I fell asleep. This morning I was straight on the laptop looking for coverage, which was a typically disappointing experience: all superficial reports that a few ‘migrants’ have drowned off Lesvos. So I wanted to write this and post it today, a small contribution to the record of what really happened and my way of remembering the Nameless. From what I could gather from the refugees last night, around 300 people were packed onto two-storey boat that looked like it was built to hold a third of that number. In the rough conditions, the weight was too much, and the top floor crashed down onto the bottom and the whole thing went down in less than a minute. People would have been trapped underneath, the children’s lungs rapidly waterlogged by the force of the water. The irony is, those with vulnerable companions pay extra for the wooden boats, because they’re meant to be safer. So more women and children, more elderly refugees and those with disabilities, went down. I’ve been thinking about the smuggler than ran that ship, how much profit he made from those extra hundred tickets and paid for with lives. Apparently he escaped in a second boat. I wonder if he’ll be haunted by this catastrophe for the rest of his life. But it doesn’t really matter. As long as this war continues, the refugees will keep coming as sure as the sun will rise. This morning we returned to the harbour. The sea is calm and life is going on. The tavernas are serving, the volunteers are back out here and a procession of new refugees make their way up the hill to the camp. The crisis is relentless, because the causes of the crisis are relentless. And as long as the EU refuses to grant these refugees safe legal passage, the smugglers will continue to exploit them. Ultimately, it is our governments with the power, resources and responsibility to act, who I hold responsible for what happened last night; and what is happening in so many nights in so many places across Europe now. One of the doctors saving lives at the harbour last night, Zakia from the UK, told me this morning that the odds of those children were never good, after being in the water for so long. “Especially here on the island, the hospitals just aren’t equipped to deal with this kind of catastrophe. You need surgeons trained to perform tracheotomies, oxygen, ventilation… To be honest, when they’ve taken in that much water, even if you can get the heart beating again, really the best thing you can do is hold them.” I did that. And that brings me some comfort, but not much. What we really need, is safe passage for the refugees. Now. 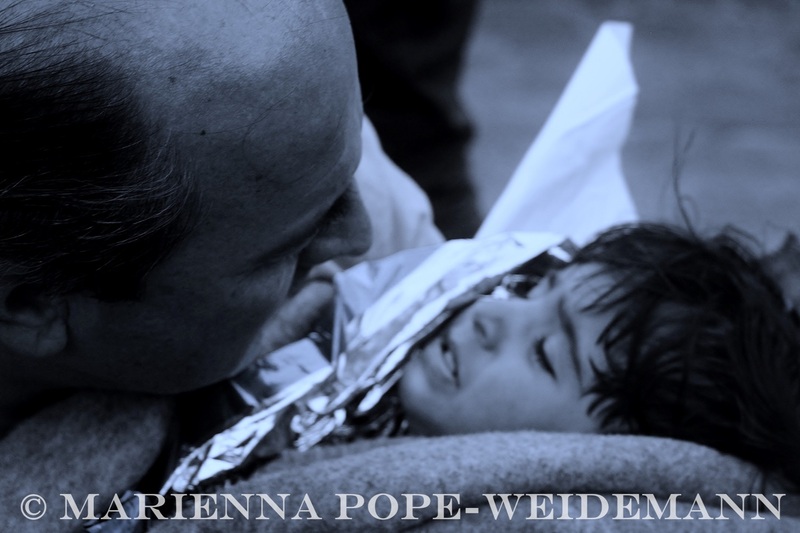 This entry was posted in Articles, Refugee Crisis and tagged crisis, greece, lesvos, migrant, migration, refugee, syria by Marienna Pope-Weidemann. Bookmark the permalink. I am sitting here, writing through my tears. Thank you for honouring these people, for letting them know that not everyone has abandoned them. Stay strong and know you are doing something good in the world. Your words matter. Thank you for sharing your story. Thank you, Marienna, for chronicling the arrival of the rescuees. I was in Molyvos in June, know Eric and Philippa and saw some footage of the drama played out last night – your written contribution was what was needed to round off the complete picture for me. Your writing style is also wonderful – really crisp and informative. I say that because a lot of the pieces churned out about the refugee crisis are too woolly to get a clear idea of what is actually happening. I’m glad you got an urge to seek God. S/He does exist and very much so, even though her/his essence and image have been much mangled by organised religions. Some of us are working on trying to raise the funds to supply a lifeboat/rescue craft for use by volunteers on Lesvos, maybe after reading this some of you might like to donate to this fundraising effort? The hopelessness we feel at times can be so overwhelming, but we do what we can. When will those in power do something to stop this needless loss of life? Thanks for sharing your experience and helping rather than just reporting. Thank you for your story, thank you for sharing and for making a diference. Your writing is so powerful and string and i hope that many people will read your story. Thank you. While you may have chosen to render comfort instead of separating yourself as a journalist, your story bears witness to the suffering and grief of so many people whose only crime is to protect their families from violence. I don’t know how you found the strength to write this but I hope you take care of yourself while serving others. Your words are amazing. I am inspired to find you. You are someone who has managed to encapsulate the reality of what is happening so perfectly that I felt a tiny fraction of the pain that these people must be feeling. Thank you for taking such care with them and helping them as you did. Thank you for writing this. It left me and many people I found chance to read it in tears and minutes of silence. I read it last week and being thinking what one might can do about this. I moved to the UK recently from Turkey where you see helpless people around you every day. I came to the decision to start a crowdfunding campaign and I thought your words as they mirror the reality so well, would help. Would you be ok with that? I would like to discuss this further. Hi everyone. Thank you all for your support and kind words. Wonderful. My email is lilly.zafer@gmail.com. I’m looking forward to discuss it further. Thank you for writing this extremely moving and eloquent testament on what is happening to the “nameless”, who are less so because of this story. Thank you as well for being there and putting yourself through what you did to bear witness and to help. I would like to ask your permission to reprint the story in The Reader Magazine which is printed and then mailed free to 390,000 people in Southern California. Please send permission asap as we are on a content deadline. I have recently published “Humans of the World” on Facebook with the sole aim to publish and re-post the works of those with first-hand experience to open everyone’s eyes to the realities of what is happening. Firstly, if anyone is reading this please share the page as it needs to go international. I have big dreams to reduce negative prejudices against asylum seekers and refugees. Secondly, Megaphone (Marie) please would you email me chloe.blades@afghanistan-central-asian.org.uk as I would very much love to talk to you further should you have even just 5 minutes to answer a few questions that I can publish on the page – mostly about the work that you have done, are doing, and what your thoughts are. I would be ever so grateful, and can pay in coffee should you ever visit Auckland! I am also a volunteer writer for the Afghanistan and Central Asian Association and they too have a Facebook page under that very name. We are working with the Afghan community in the UK, and helping those in Afghanistan too with legal aid and resettlement. Please everyone find out more about their work at http://www.acaa.org.uk. It will be really interesting to you if you’ve been moved by the current situation.